Mardi Gras means Fat Tuesday in French. The first recorded Mardi Gras was in 1699. The first one in the United States was in Mobile, Alabama, started by a Frenchman named Nicolas Langlois, in 1703. 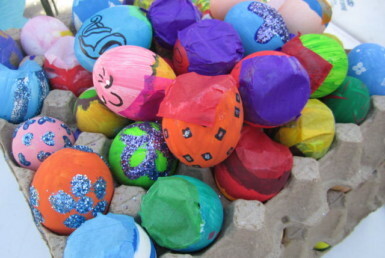 The date changes every year in accordance with Easter and the beginning of Lent. This year it was on March 28th. The next day, Wednesday, is called Ash Wednesday which is the first day of Lent. Lent lasts until the evening of Holy Thursday, April 13th. It is also called Mandy Thursday. 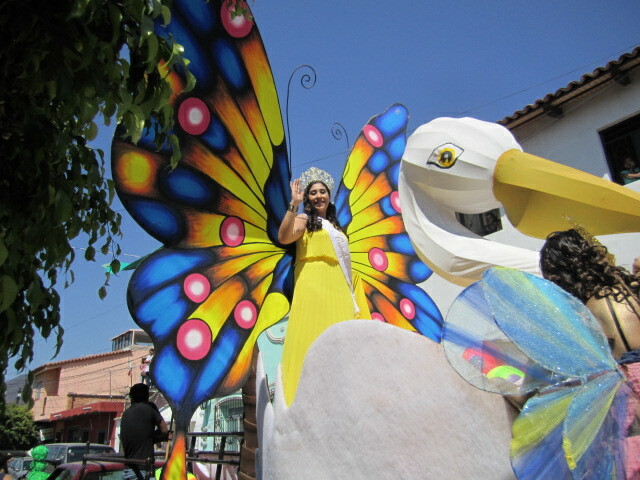 There were several beautiful young women in the parade wearing crowns. I am guessing they are all queens of the parade. This was the most spectacular float. Maybe she was the number one queen. 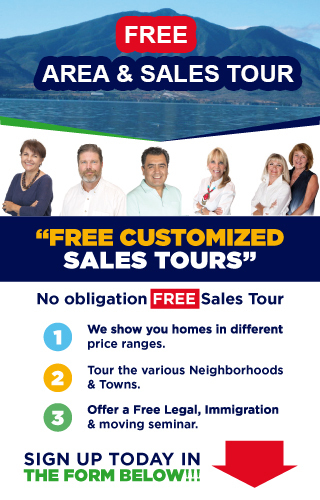 Unfortunately, parades don’t come with information packets so I am just guessing. Fat Tuesday means eating fattening foods. It means parades and parties. It means a blow out celebration before the next day, the beginning of Lent. 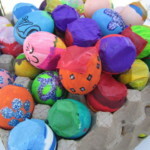 Giving up all those things and the somber time of contemplation before Easter. The highlight of this parade is the running of the boys. 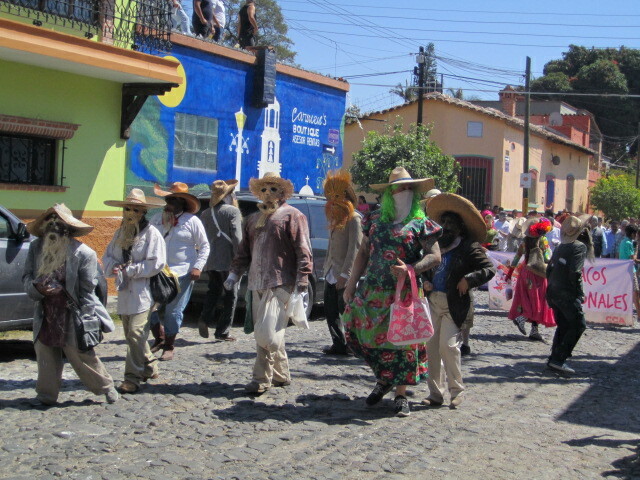 They always start the parade as they run away from the Sayaca and Sayaco, also called the Masked Marauders. 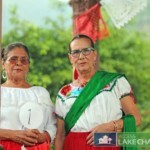 The Sayaca are dressed as women and the Sayaco are dressed as men. 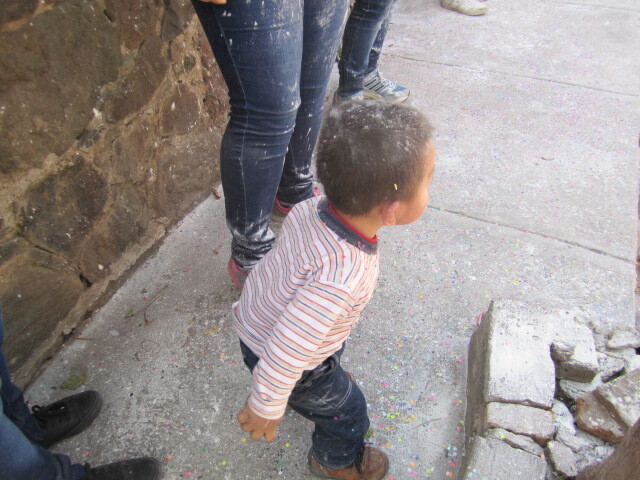 They carry bags of flour and throw it at the boys and anyone else they come upon. That is why the boys are running away. But they love every flour filled minute of it. 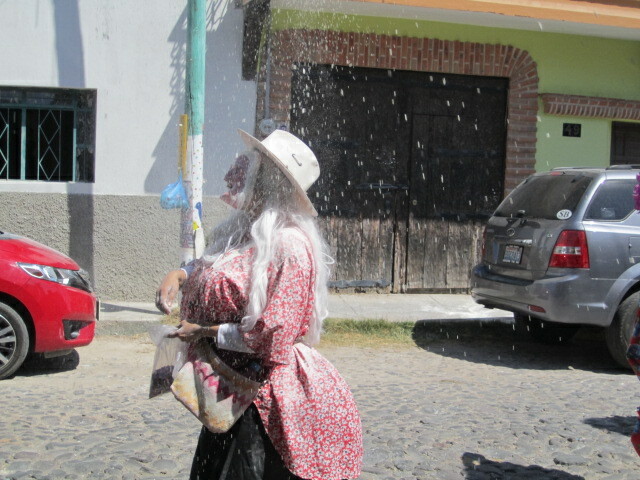 The above Sayaca not only is throwing flour but also confetti. 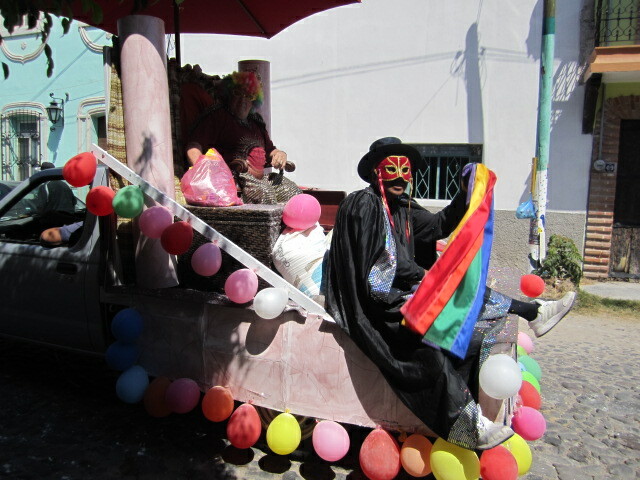 This is a typical Sayaca costume, usually worn by men dressed as women with balloon body parts and wearing a heavily painted face mask. 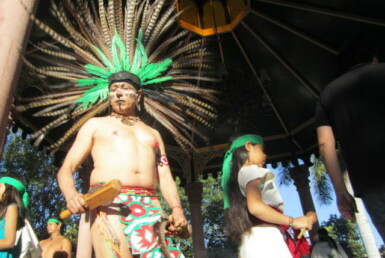 Above is a photo of an entire group of Sayacos. If you look closely at the photo you can see that the tall man on the right has already been heavily floured and past him you can see an entire area that is in a cloud of flour. 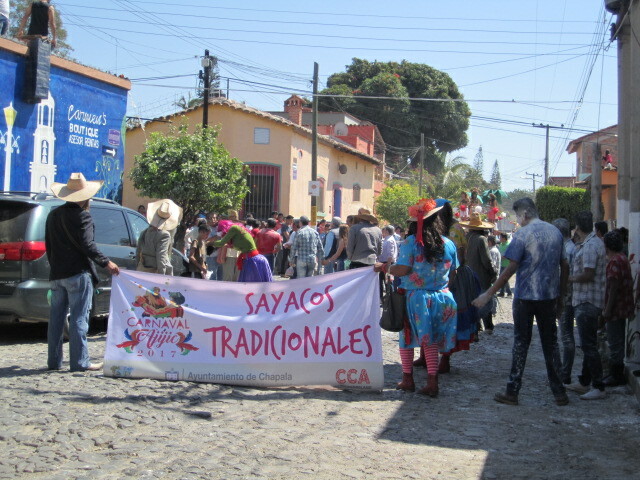 In front of the sign are mostly the Sayacos. 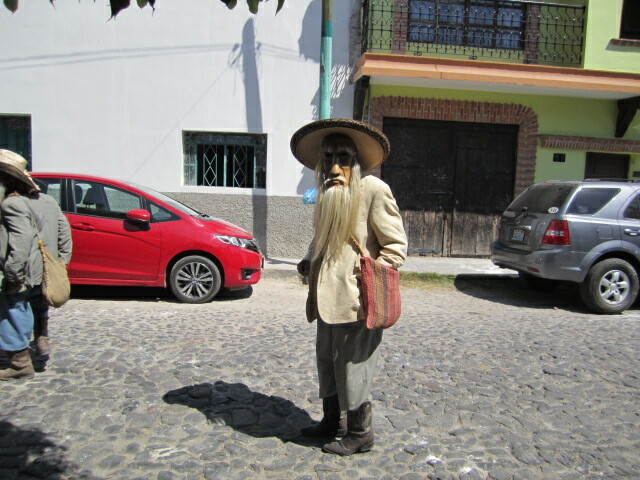 The men dressed in masks with long beards, old clothes and beat up hats, carrying bags of flour to throw at everyone within sight. 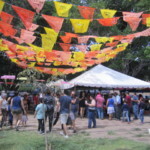 The Sayaco and Sayaca tradition has been around for many years and there are several theories as to what they represent. One theory is that they symbolize rejection of the Spanish overthrow of the native culture and ridicule of society’s rich and powerful. 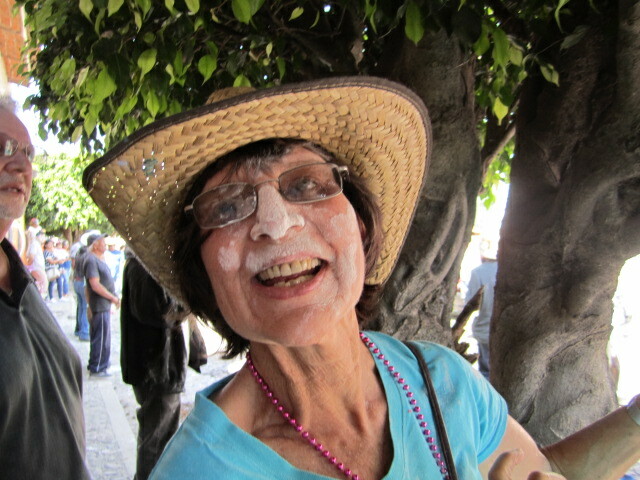 See that tree behind the smiling woman with flour on her face? I stood near it so I could protect my camera from the flour that people were throwing at everyone. It didn’t work. I was floured just as much as the woman above. If you don’t want to get floured, don’t go to the parade. Or watch it from a roof top. 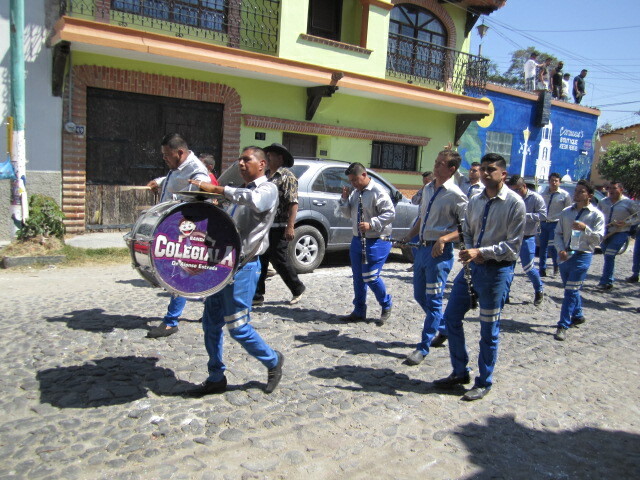 There were several marching bands in the parade. The one above was the first band to play. They dressed conservatively compared to the ones that came later on. I believe the woman above was another queen of the parade. I couldn’t get close enough to read what was written on the banner that was over her shoulder. I was still staying close to that tree. 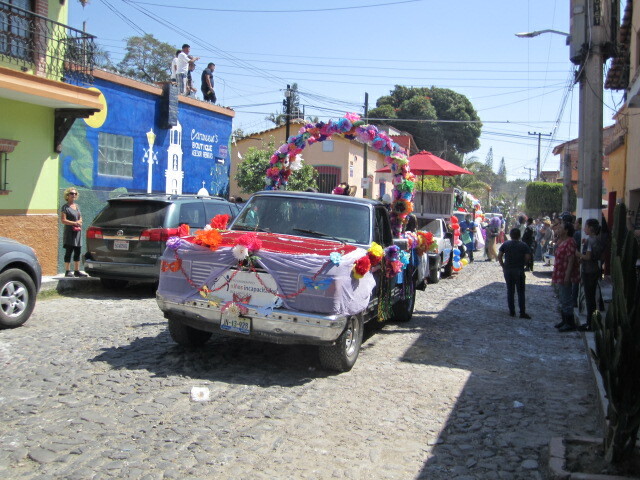 The parade this year was very large and there were quite a few floats. Some of them were advertisements for businesses, some were for local charity organizations. They were all wonderful to watch but a few had twenty five pound bags of flour that they were dipping into to throw at the crowd. I hid behind the tree when they came by. 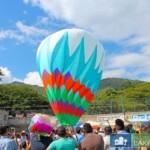 Check out the Sayaco in the above photo. He was looking directly at me with his hand in his sack of flour. I just knew I was going to get it. I turned my back on him and ducked behind the tree. He took pity on me and walked on. I liked these horses and buggies. Especially the beautiful feather head piece that the front horse was wearing. 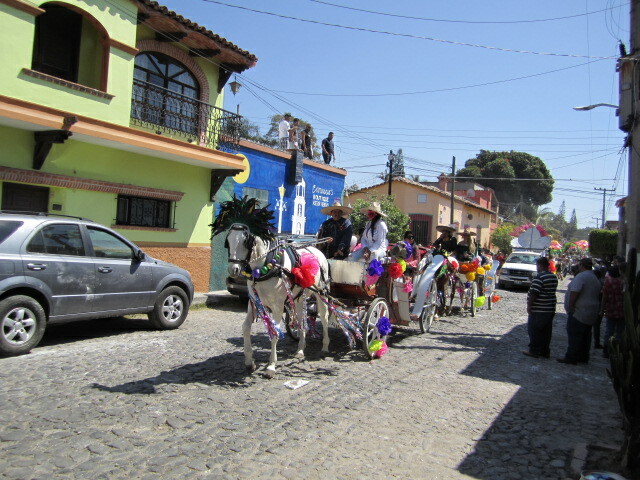 The people riding in the buggies were dressed in traditional Mexican clothing. 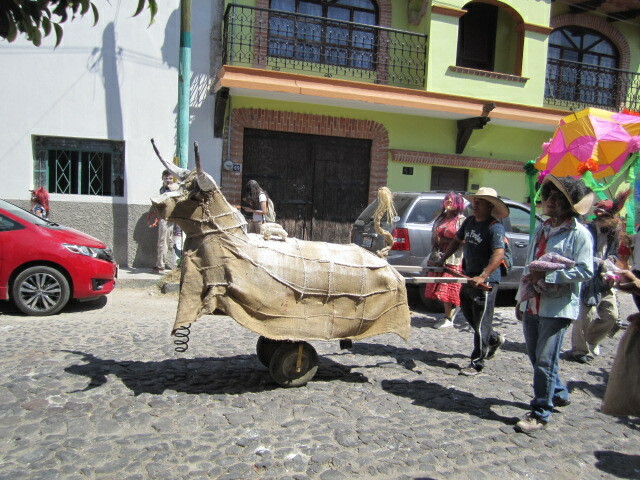 The bull was fun because the man behind it had control of how much it bucked. He allowed people to get on the bull and try to ride it as he made it buck them off. But he was very gentle with the little children. 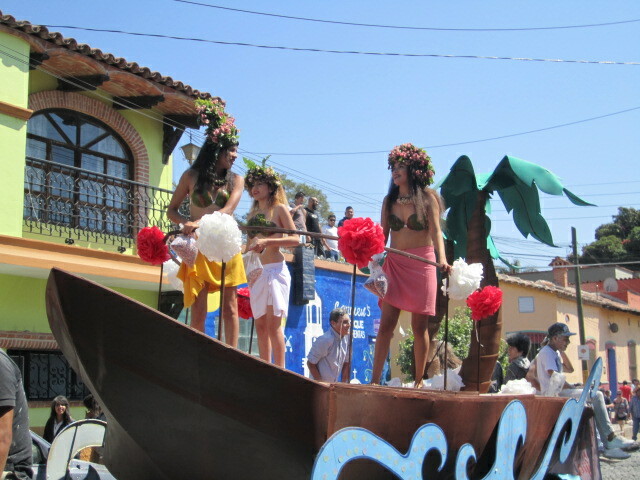 The float in the above photo was filled with children. Ninos Incapacitados. 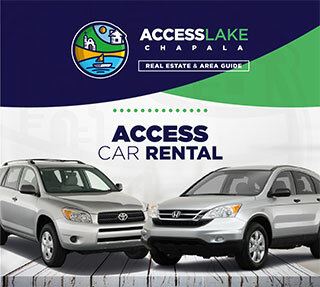 It is an organization that helps sick children with funds for medical care. It is a nonprofit organization. I don’t know the meaning of the masked man in black. Maybe he represented the King of Hearts. The colors purple, green and gold are the colors of the Mardi Gras. Purple represents justice, green represents faith and gold represents power. I don’t know the meaning of the blue. 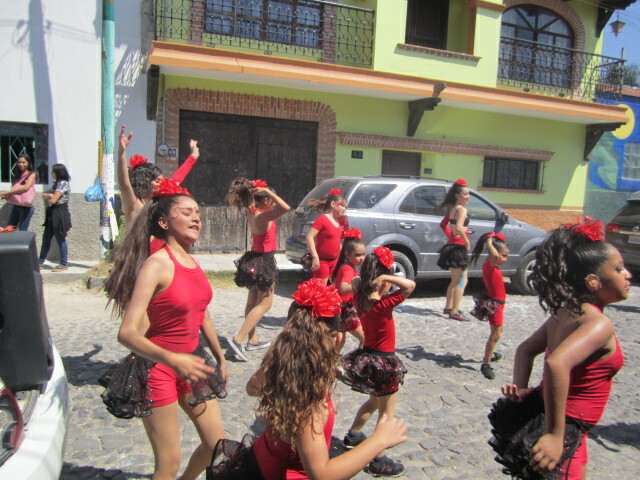 These dancers were having a lot of fun doing a salsa. They were from a local dance studio. 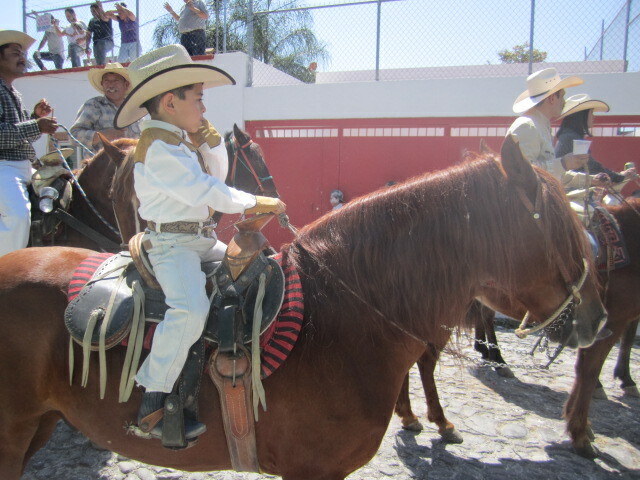 Above are the Escaramuza Riders. 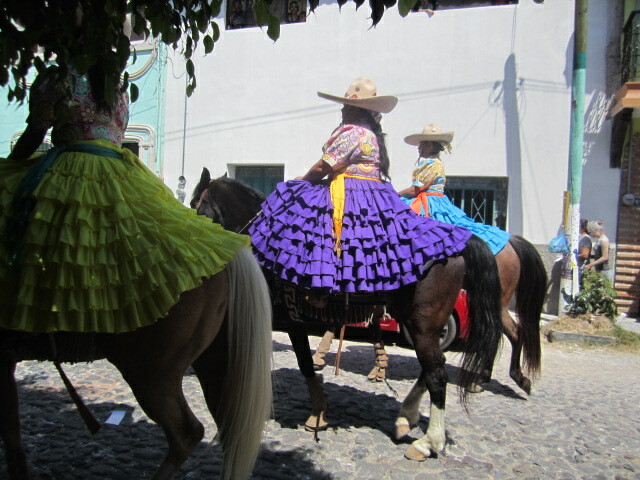 The women wear beautiful dresses and ride in patterns that are like dances on their horses. I believe they were going to perform later on in the day at the local rodeo area. 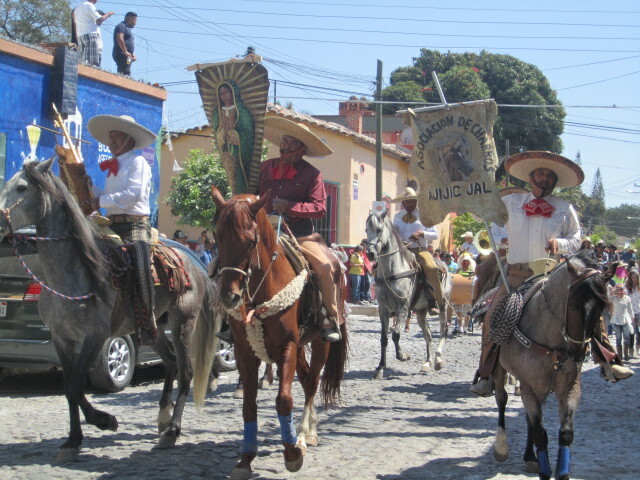 Above are the men carrying signs of their organization and of the Virgin of Guadalupe. I like the above photo because the father is so tender to his little girl. 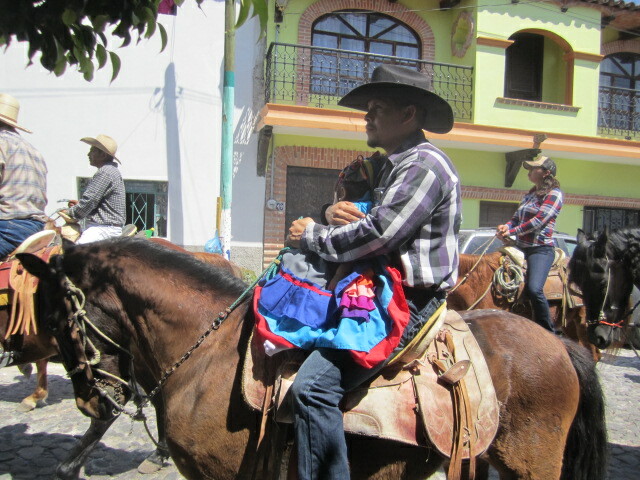 She is all dressed up in an Escaramuza outfit and I am guessing that as soon as she is old enough to sit alone on a horse, she will learn to ride like those beautiful women and become part of their group. 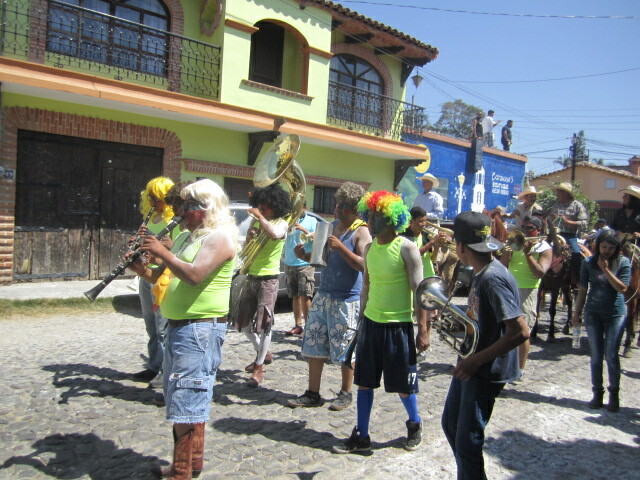 Above shows the arrival of the non traditional marching band. One of the band members was also throwing flour at the crowd. 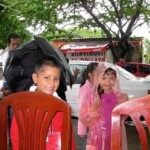 I couldn’t resist taking a picture of the little boy in the above photo. He was dancing his heart out to the band music as they past. Maybe he is a future marching band member in the making. The little boy on the horse in the above photo was doing a good job of holding his own among all the chaos of the parade. But he looked a bit uncertain. I wanted to show some of the crowd along the parade route. People were standing on roof tops. Lucky them, they were out of range of the flour throwers. 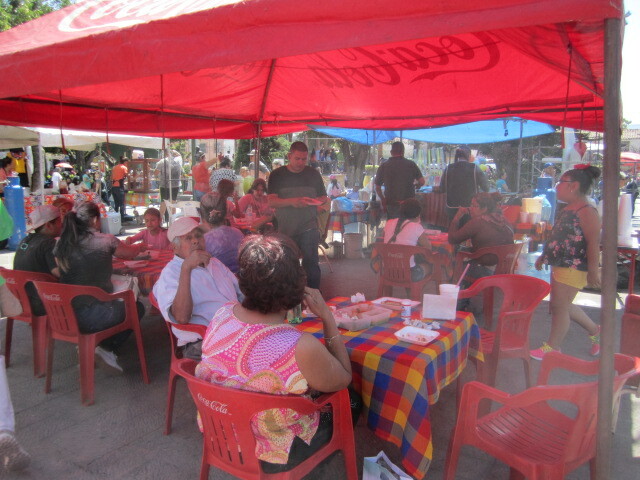 After the parade everyone went to the plaza for some rest and food. 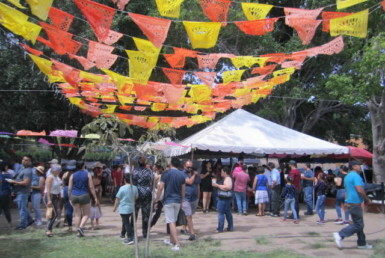 There were many stands set up that had delicious looking food on their grills. 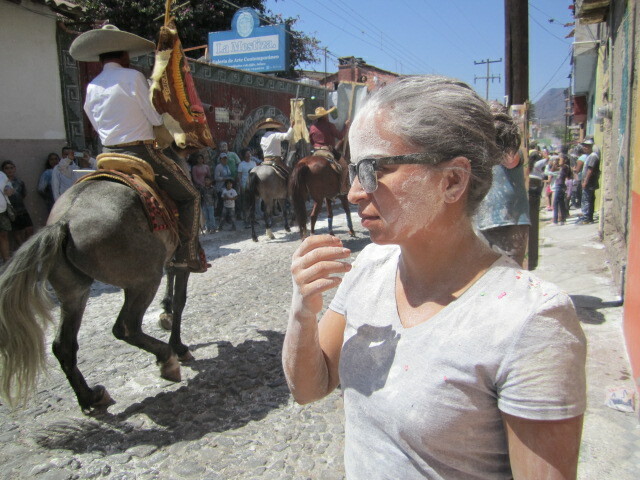 It was so crowded in the plaza that it was difficult to walk around and most of the people had been floured. It was quite a scene. 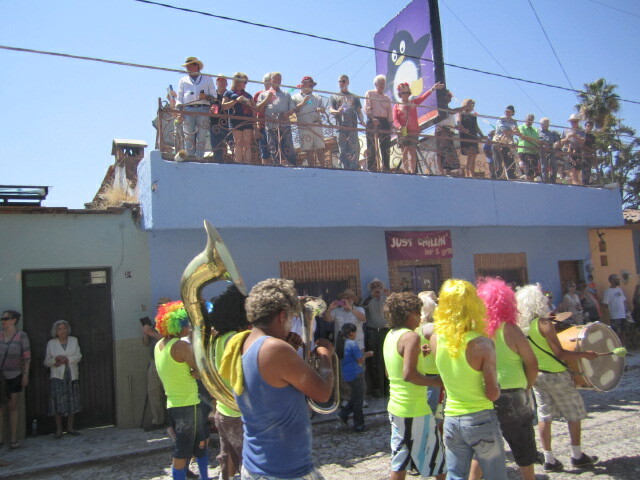 If you are ever here during this time of the year, don’t miss the Mardi Gras or Fat Tuesday parade. Just know that you WILL get floured. Try to protect your camera lens.